This installment of Dreamscarred Press’ Monster Classes-series clocks in at 13 pages, 1 page front cover, 1 page editorial, 1 page SRD, 1 page of advertisement, leaving us with 9 pages of content, so let’s take a look! Let’s not kid ourselves here – the guidelines presented in the bestiaries aren’t really doing a good job; CR = levels doesn’t work out too well – the concept needs a finer balancing. The series acknowledges exactly this requirement. The solution here would be to employ basically racial paragon/monster classes; instead of progressing in a class, the respective critters advance to grow into the full power array. While SP-gaining is presented as an option, the pdf does champion the approach of exchanging those for spontaneous spellcasting, which is drawn from the cleric list for the hound archon and based on Charisma. Testing this material, I’d add my voice to this suggestion – the experience is more versatile and rewarding. The hound archon featured herein adds message as a cantrip to his list, greater teleport as a 6th level spell. The second monster class herein would be the succubus, who also uses the cleric spell list and Charisma as governing attribute; at 2nd level, she adds detect thoughts, suggestion, tongues and vampiric touch; charm monster at 3rd, dominate person at 4th and ethereal jaunt, greater teleport at 6th level. But I’m getting ahead of myself – the hound archon’s base racial stats would be +2 Str and Cha, normal speed, they are outsiders with the good subtype and darkvision 60 ft., low-light vision, +2 to Stealth and Survival and +1 natural AC. 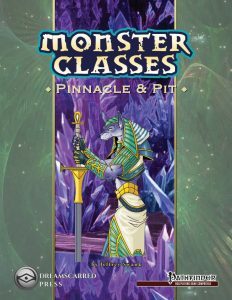 The monster class gets d10 HD, 6 + Int skills per level, proficiency with simple and martial weapons, full BAB-progression, good Fort-and Ref-saves and covers 6 levels. The class begins play with a 1d6 bit attach that increases to 1d8 at 4th level as well as change shape based on beast shape II, but only canine forms – first only Small canines and 3rd level unlocks Medium canines , 5th Large canines. The ability didn’t italicize the spell properly. The class begins play with 9 + HD SR and 2nd level provides +10 ft. land speed. Every even level of the class provides +2 natural AC and 3rd level immunity to petrification, 6th level electricity. 3rd level also provides scent and a secondary slam attack at 1d4; 4th level nets DR 5/evil, which increases to 10/evil at 6th level. 4th level provides truespeech and 6th nets the signature aura of menace. The three supplemental feats allow you to sniff out lawbreakers, smell evil…and the scaling bonus damage feat the astral deva installment had. Still not sold on that one. Attribute-gain-wise, the hound archon is a bit more conservative: He gains +2 Str, +2 Con, +2 Wis and +4 Cha. As a whole, the hound archon ends up being pretty strong, but still remains within the realms of what is acceptable within most gaming groups. I wouldn’t allow him in 15-pt-buy/rare/low magic-campaigns, but that’s it. Nice job! The succubus presented here gains +2 Con and Cha, are outsiders with the chaotic and evil subtypes, darkvision 60 ft., fire resistance 10, electricity resistance 5 and poison immunity as well as +1 natural AC. They also gain +2 Perception and +4 Bluff, for an overall imho slightly too strong base array of traits. The monster class of the succubus is 8 levels long and gets d10 HD, 6 + Int skills per level, proficiency with simple and martial weapons and begin play with 1d4 claws that increase to 1d6 at 6th level. She also begins play with 10 + HD SR. 3rd level and every 2 levels thereafter provides +2 natural armor. The Perception of the succubus increases by +2 at 2nd, 4th and 6th level. 2nd level nets gliding wings, which get upgraded to full functionality (50 ft., average maneuverability) at 6th level. 3rd level nets alter shape based change shape (italicization missing) and at 4th level, the defenses are upgraded: Cold and acid resistance 5; electricity resistance 10 and upgrade of fire resistance to 20. At 8th level, acid and cold resistance are upgraded to 10. Also at 4th level, DR 3/cold iron or good is unlocked, which is upgraded to 5/cold iron or good at 6th level, 10/cold iron or good at 8th. 5th level provides telepathy, with a range-increase at 7th level. Also at 7th level, the racial Bluff bonus increases to +8. At the final level, the succubus unlocks immunity to both electricity and fire and energy drain. The reference to suggestion in the latter ability once again lacks italicization. The succubus’ supplemental material includes Flyby Attack, Profane Gift, the nice feat for redeemed evil outsiders and Full Immersion, which lets you fully take on the personality of your disguises, even versus detect thoughts. Nice one. Attribute-gain-wise, the succubus gets +2 Str, +6 Dex, +6 Con, +4 Int, +4 Wis, +14 Cha…and this does not include the “+2” that fails to note the attribute it’s supposed to apply to. That’s 36 points. +7 to Cha-based DC. Insane. Overpowered. Not suitable for any campaign I’d run…even before taking the MASSIVE resistances/immunities into account. How this one can be in the same pdf as the hound archon…I have no idea. The pdf ends with a nice glossary for our convenience and we do not get age, height or weight tables or FCOs. Editing and formatting are okay -the pdf sports unnecessary glitches and a couple of annoying formatting hiccups. Layout adheres to Dreamscarred Press’ two-column full color standard and the pdf comes with a second, more printer-friendly version. The pdf has no bookmarks, but needs none at this length. The artwork is okay. Jeffrey Swank’s Pit and Pinnacle’s title couldn’t be more eponymously named – while the powerful, but well-tuned hound archon represents a pinnacle in the series, the succubus represents the very worst the monster class-series has to offer, OP in all but the most powerful/who cares about balance/minmaxy environments. How to rate this, then? Well, in the end, I’ll settle on exactly the middle -at 3.5 stars, rounded down to 3 for the purpose of this platform. You can find the whole subscription here on OBS!